Glazart will once again welcome you to its 50 tons of sand in the heart of Paris: free concerts, showcases, brunches, clubbing evenings and entertainment will be on the agenda non-stop over 4 months in a dream setting. 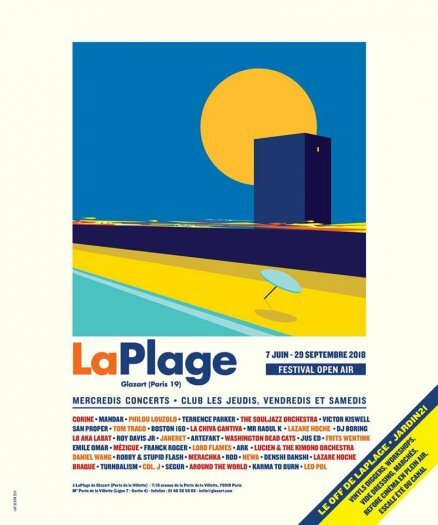 LaPlage is striving to become the first outdoor club in Paris with concerts until early morning. A space dedicated to music and fun will welcome you every day and week-end: deckchairs, green spaces, outdoor furniture, restaurants, food trucks, bars, merchandising shops, all located within the walls of Paris ! Bring your ID, some concerts are forbidden to underage or non-accompanied kids under 16: ID required for entry as well as proof of kinship. Please consult LaPlage website for terms of access. From 21st June, for the Fête de la Musique, many festivals... Porte de la Villette will surely be the hottest place in the capital: in the heart of the city during summer, a privileged space to be where you can sway to the rhythm of exceptional music.